Humankind is living from four essential natural resources: fertile soils, clean air, fresh water, and biodiversity. The global land area amounts to 13.2 billion hectare (ha) of which 3.7 bn ha (28%) is forest, 4.6 bn ha (35%) is grassland and woodland ecosystems, and only 1.6 bn ha (12%) is used for agricultural crops (FAO 2011). It is a really startling phenomenon: although considering today's multiple challenges with soil degradation, medium-term growing global population and mounting impacts of climate change, in many societies, countries and national states fertile soils are still treated tremendously carelessly or even in a destructive way, just so as if it didn't matter to preserve and regenerate this pivotal element of essential natural resource and fabric of human societies. Let us lift the whole issue onto another level: At the latest from Howard (1947) we know that there is a fundamental link between fertile soils and human health. Since then scientists have found growing additional evidence that soils with rich diversity of life are ipso facto capable to produce nutrient-rich food. Furthermore, there is a correlation between bacteria in soils and in the human gut (Wall et al. 2015). And everything in the food system between the soil and human gut may touch our health, from farming methods and crop varieties to food processing, cooking and eating. When we change one thing in an interplay-ecosystem, we change many more (cf. Roberts 2008; Rundgren, 2015). So, from all we know, there is more than enough reason to treat soils very carefully, to use, maintain and eventually – that is one of our key points – improve every hectare and every square kilometre. It is no exaggeration to state that human existence is essentially dependent on the wispy skin of terrestrial ecosystems, some 20-50 centimetres of topsoil. Topsoil is one of the most important resources and, for the recent centuries, it has been under increasing pressure by i.a. intensification of production, erosion, contamination with agrochemicals, and industrial pollution. The pace of soil destruction, sometimes only a matter of minutes, has far outpaced that of soil regeneration. It takes between 100 and 500 years to build up one centimeter of new productive soil by natural processes (SWSR 2015). Healthy soil is not only a highly productive layer of the earth's surface, rather it is a natural body with regular structures and specialized features, a subsystem within the diversity of ecosystems. Soils are not simple substrates to root plants, but an ecosystem in themselves, an unbelievable complex and marvellous interplay of physical, chemical and biological elements, networks, species, and food chains. The soil cover, or pedosphere, is a zone at the boundary of biosphere and geosphere, a specific membrane, regularly differentiated in space and depth, that facilitates biospheregeosphere interactions. The pedosphere is part of the lithosphere, and is also penetrated and saturated with elements of all other geospheres: with gases, water, solutions, as well micro-, meso-, and macrobiota (Rozanov et al. 1990). Often the complex interrelationships between microbial, animal and plant webs in fertile soils are not duly incorporated in agricultural thinking and practices as well as in policy, obviously because we cannot see it, and, partly, because relevant, specific, and long-term data is scant and/or fragmented. 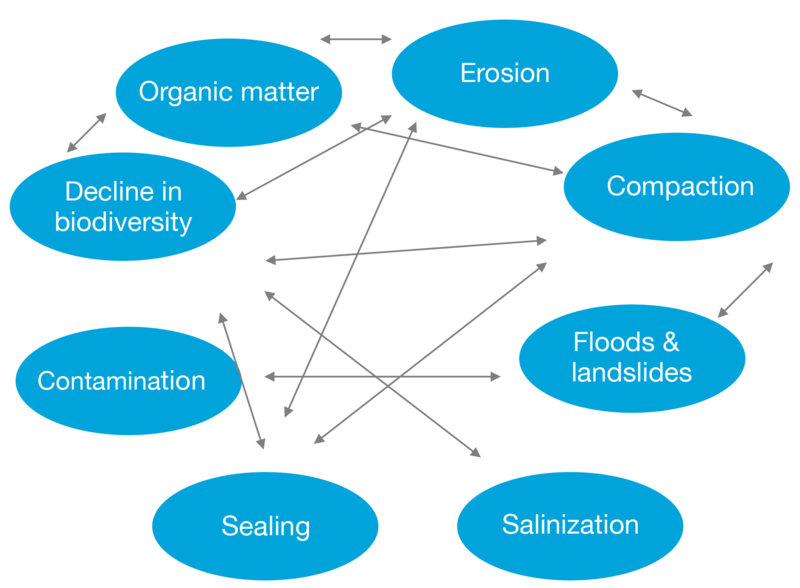 The complexities of the ecosystem soil requires particularly systemic thinking and research strategies for better understanding it (Albrecht 2011). Soils build the biggest carbon reservoir, containing more carbon than the atmosphere and all terrestrial vegetation combined. Relative small changes in the amount of organic matter in soil can have a major effect on the atmosphere and so on global warming (Soil Atlas 2015). Also, it is widely accepted that humus and soil organic matter play a crucial role in generating and maintaining healthy soils, both in terms of physical structure and supporting the life of micro-organisms that live in the soil (EC 2015). “Carbon is the main currency in use in the majority of transactions between living beings, and this is most patently in soil.” (ideaa 2015) Also, humus has beneficial effects on several ecosystem services, such as primary production, soil formation, biogeochemical cycles and the regulation of water quality and climate. Any loss of humus and decrease in organic matter, e.g. by oxidation following cultivation, the withdrawal of grass-leys from rotations or the absence of animal or green manuring will thus have negative effects, not only on soil health, but also on the release of carbon into the atmosphere. 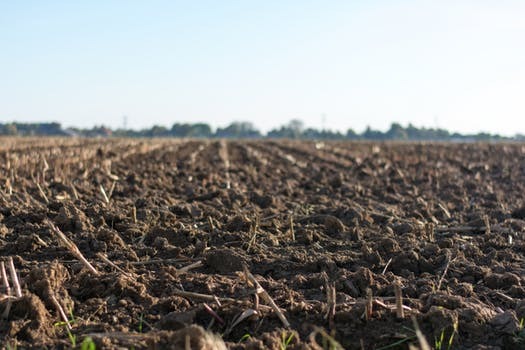 There is clear evidence of decline in organic matter content in many soils as a consequence of the unprecedented expansion and intensification of agriculture during the 20th century. The decline in humus and organic matter content is a threat also to the stability of agricultural production systems. Four types of soil degradation are generally distinguished: (i) erosion (wind and water); (ii) physical (compaction, laterisation, hardsetting); (iii) biological (loss of soil biodiversity); and (iv) chemical (depletion of organic matter and nutrients, contamination by mining activities, industrial activities, agricultural activities) (EC 2015). Some degradation processes may go off quickly, others more creeping, but all are closely interrelated (see Figure 1) and have an important bearing on the soil functions for plant production (see Figure 2). Despite the tremendous scale of global soil degradation, only fragmentary and inconsistent data on the rate and pace of degradation processes are available. For erosion by water, figures range from 20 to 200 billion tons globally per annum. Erosion rates for wind show a range from 0.5 to 3.3 bn t/annum. Amazingly enough, there are very few quantitative assessments of wind erosion rates on arable land outside of the United States. “Estimated rates of soil erosion of arable or intensively grazed lands have been found to be 100 - 1000 times higher than natural background erosion rates. These erosion rates are also much higher than soil formation rates which are typically well below 1 ton per ha/per year with median values of some 0.15 ton per ha/per year. The large difference between erosion rates under conventional agriculture and soil formation rates implies that we are essentially mining the soil and that we should consider the resource as non-renewable” (SWSR, 2015: 103). The International Soil Reference and Information Centre (ISRIC) estimates that of the 11.5 billion ha of vegetated land on earth 24% had undergone human-induced soil degradation, with erosion the main process (ISRIC 2009). These figures not only are serious and precarious regarding the ecosystems but also for the social fabric of many countries. In 2010, of the 4.25 billion global rural population, 1.5 billion lived on less favoured agricultural land (LFAL) and 1.4 billion on degrading agricultural land, whereas 1.5 billion lived on improving agricultural land (Barbier & Hochard 2014). Drylands in arid, semi-arid and dry sub-humid regions are estimated to make up about 41% of the earth's surface. These regions are inhabited by nearly 2 billion people (Reed & Stringer 2015). Food insecurity and poverty still hit predominantly rural populations (FAO SOFI 2016). There is clear evidence on the nexus between poor ecosystem functioning and services, soils, and poor and hungry human beings (IAASTD 2009). Impoverished peasants – female or male – in many cases have no secure access to land and related land tenure, thus no long-term perspective on their soils. Conservation and enhancement of soil health and fertility indeed requires appropriate activities as well as a long-term perspective. Many examples from all continents deliver evidence on successful practices for improvement of soil fertility along with livelihoods (see some exemplary cases in this volume: Nothing is more inspiring than good examples, p. 45). First of all, there is insufficient up-to-date knowledge both on the area affected by soil degradation and on the linkages between degradation, soil functions and eventually resulting food and agricultural production. As a result, the ability to predict the effect of soil degradation on food security is limited (Stocking 2003) - and what we don’t sufficiently know is difficult to manage. Secondly, the prevailing market system does not orient farmers to practise land stewardship. On the contrary, so called modern farming has removed much of the land husbandry, regenerative care and stewardship that was previously an integral part of most farming systems. It is not realistic to assume that the market will take care of managing soils as de facto non renewable natural resource – at least as long as external effects are not significantly priced in. The adoption of measures for soil fertility improvement or conservation is often not sufficiently near-term beneficial to farmers. This applies the more they are market-oriented and in particular the more they are integrated into globalized markets (SWSR 2015), as external inputs for some time can seemingly compensate deficits in natural soil fertility. This is as true in intensive mechanized systems in OECD countries as it is for smallholder and family farming in less industrialized countries. Likewise, detrimental effects of soil degradation often become evident only after years or even decades, especially if farms are capable to invest in technological substitutes such as synthetic fertilizers, drainage, irrigation etc. Thirdly, the prevailing conventional agronomical understanding of yield and productivity does not or poorly appreciate the pivotal role of soil, its fertility and its non-renewable nature. Productivity in agriculture can be measured in many ways: yield or nutrient per area unit; per person-hour; per unit of deployed capital; per energy input or per water unit. The comparisons can consider as well total biological production, ecosystem services or exclusively what is directly useful to humans in the form of food, fiber, feed and fuel. One can however also ask if productivity so measured is serving to maintain the productive resources or if it is based on extraction of nonrenewable resources, resources which perhaps were abundant but now are increasingly scarce. What means productivity if the production is based on the unsustainable use of irrigation, fossil fuel and soil management practices which sooner or later erode and thereby destroy the soil? As globally the ensemble of natural resources dwindles, regeneration, prevention of degradation, and improvement of soil fertility must be seen as top priority in order to regain truly productivity. Soil recovery would be one measure to enhance productivity and should thus be duly considered in productivity indicators (Rundgren 2015). Fourth, secure access, tenure and ownership of land, i.e. of soils provide resources and livelihoods and thereby imply social and economic power. Therefore the social regime of access, disposition, tenure and ownership is of key importance. The unjust distribution of fertile soils across the globe not only contributes to poverty and hunger but also to unsustainable soil management. The unresolved issue of an equitable distribution of individual and/or common land rights and ownership in many countries has been masked during some decades by the illusion that industrialization and urbanization would marginalize the relevance of soils and agriculture for the economic and social development. The increasingly manifest impacts of climate change however are a strong reminder of the fact that soils together with clean air and freshwater are the most fundamental commons for the survival of humankind. In most countries, the majority of land is owned by a very small number of people (the feudal lord, the local squire, the village chief, the hacienda owner, the rancher, the plantation baron and recently also institutional foreign investors). According to recent reviews, land tends to be even more unevenly distributed than income (Pearce/ILC 2016). Privatization of land tenure often has been promoted by conventional economic wisdom to overcome the so-called Tragedy of the commons (Hardin 1968), where overuse of land and other resources eventually lead to ecosystem failure. The increasing market orientation of farmers, unlimited mobility of capital, globalization of markets and the resulting indebtedness of producers have been key drivers of privatization of land ownership, because land or livestock are often the only assets of farmers that can be collateralized. Yet, the prevailing market system and its pressure on specialization, economies of scale and cost reduction tends to relegate soil to a top-soil layer that most efficiently converts mineral fertilizers into agri-food commodities. Decades of alignment of agricultural production towards higher yields of a single crop per hectare nearly inescapably resulted in the application of external fossil inputs such as synthetic fertilizers and pesticides. Long-term sustainable and healthy soils are however in need of diverse polycultures, including trees for the preservation of soil structure, organic matter content, water holding capacity, aeration und microbial communities. The importance of this requirement grows vis-á-vis the grievous consequences of climate change. Treating land and soils as a common or as a private good is by far not only an economic issue. We see from commonly managed land on all continents that the social fabric of communities is closely intertwined with land and that the appreciation of land and soils is far stronger (Blackman et al. 2017; Pretty et al. 2011). Fifth, the prevailing globalized corporate market system and its underlying rules are dysfunctional for shaping the agro-food systems in the best way towards planetary stewardship, a role that is increasingly important as agriculture occupies more and more of the surface of the planet and natural resources are under growing pressure. There are almost no market mechanisms in place to support agroecological economies and there is limited potential for them to emerge. How distorted the prevailing economic structures are is highlighted by the fact that soils as ecosystems are globally the most precious assets which, according to some estimates, annually generate more than twice the size of the world's Gross Domestic Product (GDP) in 1997, namely US$ trillion 33; in 2014 this figure went up to US$ 125 trillion. On the other hand ongoing land use change resulted in an annual loss of roughly US$ 20 trillion (ELD 2015). Sixth, the area of land and water needed to supply a mean global citizen is scattered all over the planet resulting in the phenomenon of virtual soil (and water) imports by global trade of feed and food. As a consequence, soil degradation and loss of production are not just local or national issues – they are genuinely international ones. Whereas locally focused and local resource-dependent production very much depends on resource stewardship and reproductive approaches, globalized food supply chains and their treadmill pressure, caused by cost externalities, lead to resource-mining, including soil erosion, depletion, pollution etc. (McMichael 2013). This makes it very challenging to create the awareness and build the momentum that soil stewardship and related soil quality are international problems that require a comprehensive international governance framework. In the light of the above, it is unrealistic to assume that rapid changes towards soil stewardship and regeneration of productive resources for truly sustainable farming can be expected as such by now. As a matter of fact, soils and soil fertility are neither recognized as common heritage of mankind, nor as an international environmental problem and looming global threat which needs action. This is all the more astonishing and worrisome as global carbon emissions will have to be drastically cut in the next two to three decades, in fact going as far as negative emissions (i.e. the removal of carbon from the air) in the post 2050 period (Mitchell et al. 2016; Hansen 2009). Given the enormous scale and time pressure, agriculture is the only sector that already disposes the ways and means to make carbon sequestration happen. Soils and soil management play a pivotal role in this regard, because carbon sequestration in soils accounts for the bulk of the technically feasible mitigation potential in agriculture. According to the Assessment Report IV of the Intergovernmental Panel in Climate Change (IPCC 2007), the global technically feasible mitigation potential for agriculture is estimated at 5.5 to 6 gigatons (Gt) of carbon dioxide-equivalent per year by 2030. 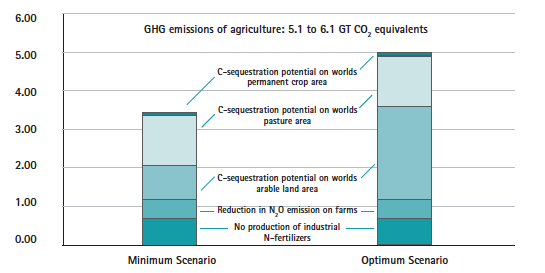 Almost 90 per cent of this reduction can come from carbon sequestration in soils (see Figure 3). At present soils and vegetation already store a quarter of the anthropogenic carbon (Global Carbon Project 2017). manage water efficiently, and control machines and field traffic to avoid soil compaction (cf. VGSSM 2016). Thousands of different soil and land management practices have been developed during the history of humanity around the world in response to local biophysical, social and cultural settings (cf. WOCAT 2007). Most human cultures have deep connections with the land, and soil is venerated in diverse ways (Churchman & Landa 2014). In many regions, traditional knowledge still plays an important, and often decisive role in determining land management. However, many traditional systems have been disrupted, destroyed or modified. The two most common causes have been the loss of access to land (e.g. invasion and displacement; increasing population densities causing shorter fallow periods on smaller areas; loss of access to grazing lands) and the introduction of external input-intensive technologies (Churchman & Landa 2014). The nexus perspective, which takes into account the whole system with its interdependencies between soil and soil biota, water, energy, climate, vegetation, animals and people. The multi-scale perspective that pays attention to the interactions of land use and natural systems on and between different scales, from local to landscape to national and global. The multi-time perspective reflecting short-, medium-, and long-term impacts and feedback from land management options. The multi-stakeholder perspective that reflects the interests of all people living on, and using land in different parts of a landscape, different sectors depending on, and using land, different levels of decision-making and governance related to land management and different sources of knowledge – scientific, local and practitioner’s. There are also trade-offs that need to be carefully analysed and taken into account by science as well as governments in an effort to encourage the use of sustainable land management practices such as: (a) production, income and livelihoods versus ecosystem preservation. Not rarely, there is a conflict between short-term economic interests and the long-term preservation and improvement of ecosystems. The more farmers are integrated into value chains of global markets, the higher the economic pressure on specialization and artificially boosted output by agro-chemical inputs and the lower the interest and freedom to pay attention to and invest in soil stewardship. (b) Long-term versus short-term costs and benefits. Some practices need higher investments in the short term but only yield benefits and returns in the long run. (c) On-site versus off-site effects. Sustainable management of soils often has positive effects beyond the direct area of its implementation. This is why for most management measures at landscape level, some people receive more benefits or incur greater costs than others. (d) Private versus public goods. When the depletion of a common resource such as soils has benefits for individual users without immediate consequences from the thus caused degradation, there is little incentive for soil preservation (Liniger et al. 2017). Most of the depicted approaches and measures are more or less known to practitioners as well as political decision makers. But, as of today, all this knowledge has not gained enough momentum to turn the direction of policy, practice, and science. So, what elements and issues can strengthen and accelerate a momentum of change? From a practical point of view, one key factor for enhancing soil fertility is to channel as much sugars and amino acids from the sunlight's assimilation processes via plant roots in the soil's nutrient cycles and food webs. Therefore priority one is to maximize leaf biomass' density on the field. Largest possible root extent is also important, which grows in organic agriculture, where roots have to look for nutrients and sufficient supply of essential micronutrients. Allseason plant cover means all-year support for healthy soil life. Decisive as well is the constitution and regulation of secure access to and land ownership. Given that land is treated as common good, local stakeholders should organize themselves according to the principles that i.a. Elinor Ostrom has characterized as well as is evident from manifold experience from community and participatory practices. To sustain and thrive under increasingly adverse climate and environmental conditions, agriculture needs a new mind-set and general principle. Instead of looking to productivity in a reductionist way from the perspective of a single crop yield per hectare, regeneration of substantial resources must be incorporated as an essential element in the productivity paradigm. Especially for soils, where degradation and loss often becomes visible only in longer terms, regeneration and improvement of fertility is crucial to face the mounting challenges of climate change, water scarcity and related national and international political conflicts. Therefore an understanding of inclusive and comprehensive productivity should be implemented. Research has to revive and design methods and concepts to better understand and be able to work with the vast complexity of soils as an ecosystem in itself. Regeneration and reproduction, in particular as regards to soils, are as essential in the farming system as production (Gregorich, Sparling & Gregorich 2006). Building up humus and soil formation as part of sustainable land management can be a selfreinforcing process: healthy soils will reproduce and thus can better improve over the years. According to the revised World Soil Charter: “Soil management is sustainable if the supporting, provisioning, regulating, and cultural services provided by soil are maintained or enhanced without significantly impairing either the soil functions that enable those services or biodiversity. The balance between the supporting and provisioning services for plant production and the regulating services the soil provides for water quality and availability and for atmospheric greenhouse gas composition is a particular concern.” (FAO 2015: Para 5). The significance of soils in policy agenda setting and formulation has been weak in most parts of the world. Reasons for this neglect include the multitude of local and regional soil status, lack of ready access to the evidence needed for policy action, the challenge of dealing with a natural resource that is an important common good but often privately owned, as well as the long-time scales involved in soil change. Furthermore, there are only few countries, in which the government has a dedicated soil policy linked to targets on sustainable soil management. And even if elements of soil policy have developed, implementation might be weak. As a result, communities and institutions often do not respond until critical and irreversible thresholds have been transcended. Perhaps even more significant also for policy and politics is the disconnection between increasingly urbanized human societies and the soil. The task of developing effective policies to ensure sustainable soil management is neither simple to articulate nor easy to implement. This is true regardless of a country’s stage of development, its natural endowment with soil resources, or the threats to its soil function (FAO 2011). Although soil is truly a common heritage of mankind, a public good of strategic importance for food sovereignty and security, health, adaptation and resilience to environmental disasters, ground and surface water management, climate change mitigation, and, related to all of that, an important public good for maintaining peace and security nationally, regionally and globally, it is strange that there are no comprehensive international treaties or agreements to protect the soil, support soil restoration and recovery and an appropriate application of sustainable land management methods. Until today the UN system is fragmented: the UN Convention to Combat Desertification (UNCCD), which carries out utmost important work, though has no broad mandate for soil issues, FAO with its mainly production-boosting perspective, and UNEP with its environmental focus produce rivalries as well as synergies, notwithstanding some signs of hope. As already mentioned above, bold and consistent actions by national governments or international organizations are unlikely to counter or mitigate effectively the ongoing soil mining, erosion and destruction trends caused and driven by the treadmill pressure for specialization, economies of scale and cut-throat cost pressure of the globalized market structures with its powerful vertically integrated corporate actors. For some decades, the global trade of agricultural commodities represents a detrimental regime of international division of labour as well as of social and environmental impacts. Exporting countries such as Brazil bear severe harm to soils whereas importing countries such as the EU spared pollutions of rivers and groundwater. Unless soil or soil capacities, properties and services are internalized in agricultural costs and prices, governments will have to resort to payment, reward (i.e. rewarding environmental services that generate or maintain public goods) or subsidy schemes so that farmers get an immediate and short-term incentive for investing in long-term improvements in soil management, improving soil fertility, avoiding or reversing erosion, and enhancing soil functions. Such schemes are explicitly allowed under the WTO Agreement on Agriculture. In fact, the huge subsidies doled out in OECD as well as a number of less industrialized countries for chemical fertilizer use and irrigation would be better directed at such payment-for-environmental-services (PES) programmes. Truly sustainable, therefore regenerative agriculture cannot use the shortcuts of industrial, i.e. fossil fuel-driven agriculture. In other words, a higher focus on soil rather than oil implies that local markets, local resources and local nutrient cycles become far more important, which puts a huge question mark on the pressure for yet more globalization and related market orientation. In fact, a single politico-economic measure – the drastic increase of prices for crude oil based fuels – would trigger considerable changes, including in favour of more sustainable soil management. Intensification and industrialization of crop and livestock agriculture have taken place in many regions around the world for at least five decades. But overall no appropriate and continuous research on impacts, interferences, and interdependencies as regards soils have been performed. This grave deficiency is not only a challenge for scientific institutions and networks but also for policies and politics. A similar area for which data and knowledge are scant concerns industrial soil pollution by substances such as mercury, heavy metals, industrial wastewater, or sulphur. The actual global extent and magnitude of polluted soils remains unclear. A long-term global soil monitoring network is needed. “While the direct impacts of sulphur, nitrogen and trace elements on inorganic soil chemical processes are generally well understood, many uncertainties still exist about pollutant impacts on biogeochemical cycling, particularly interactions between organic matter, plants and organisms in natural and semi-natural systems” (Greaver et al. 2012). Process understanding is dominated by research in Europe and North America (e.g. Bobbink et al. 2010). Research therefore needs to be conducted also in other regions where soil properties and environmental conditions are different. Sustainable intensification – How can we get the benefits from intensification while minimizing the associated environmental and social costs? Trade-offs between soils and efficiency – How can we manage for resilient soil and related ecosystem services while continuing to maximize efficiency? To what extent can we have both? Soil degradation and intensification – What is the extent of degraded soils? There are currently no sound estimates. What portion of degraded soils can be attributed to un-sustainable intensification? Options and trade-offs for improved soil management – What can we learn from management practices used in intensification areas to help restore degraded soils? Are there any options that can integrate best management practice for sustainable intensification? What are the short- and long-term trade-offs of resource use and sustainability? What are the environmental and social costs and economic benefits of land use intensification? Farming practices and soil health – How do changes in harvest frequency and crop rotation affect soil resilience? How much change is needed to restore degraded soils? In addition, there is the need for better cropland information in terms of extent, purpose and intensity of use (see the Synopsis of politico-scientific information networks and tools in this volume, p. 62). There is also consensus among scientists that trans-disciplinary and participatory research should be strengthened. In this regard, the following issues should take centre stage: (i) empowering land users and decision makers. In particular, this shall concern the larger picture in terms of system complexity, space and time; (ii) working cooperatively between scientists and practitioners; (iii) developing an advanced and joint understanding of complexity; (iv) flexibility and adaptive management of research processes, and (v) think and act in long term perspective (IAASTD 2009; IPES 2015; Liniger et al. 2017). Issues of soil functions, biology, chemistry, the interplay of soil with other global resources, soil degradation, rehabilitation and fostering soil fertility as well as the interrelationship between soils, food sovereignty, and climate change should play a far more important role in education, training and extension, beginning with primary education. The present-day state of soil science, soil management, and soil policy is fragmented, sketchy, and inconsistent – though many encouraging initiatives and examples illustrate sustainability oriented and sustainable practices. 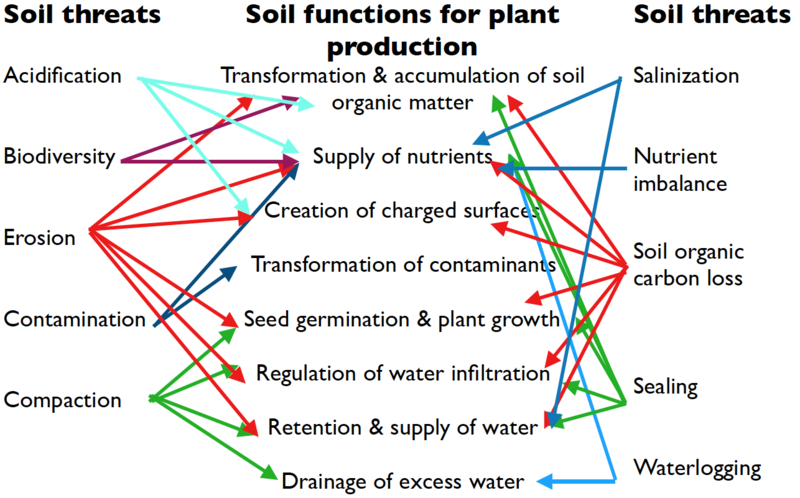 The altogether unsatisfactory state of soil affairs not only is due to the complexity of soil issues but also to a deficiency of constant attention for the fundamental importance of fertile, healthy soils for healthy human societies (Amundson et al. 2015), and a fortiori for transitions towards sustainable development. What is until today critically lacking is public awareness, political priorities, public long-term and comprehensive research, bold legal and administrative rules on the national as well as international level, and economic incentives and tools in order to promote caring and sustainable use and enhancement of fertile soils. Most of all, a new consciousness for the sensitivity of the pedosphere and adequate care is needed. Meanwhile conceptualizations of transitions to improved, healthy, and fertile soils have emerged. In addition, the soil food webs and networks can give us an allegory for the structures and functions which we need to establish a holistic and sustainable approach to soils as main-stream practice. Diversity, mutuality, circularity, and synergy are crucial principles of the productive interrelations between biotic and abiotic spheres and between diverse trophic levels. These principles can also be applied to the interrelations of humankind with the living webs which sustain human societies. Make rehabilitation, improvement, and conservation of living soils a cross-cutting top priority for policy. Fertile soils are literally lifelines of human societies and nonrenewable resources. De facto, a situation of multiple crises has emerged that again is largely unperceived by the wider public as well as by many governments. There is urgent demand for immediate, long-term oriented action on all levels from local to global. Constructive options for policies and actions are on the table but coherent frameworks and decisions are largely lacking. Promote the recognition of living soils as common goods and a common heritage of mankind. Constitution of fertile soils proceeds in timeframes from decades to centuries. So, soils are a non renewable resource which can't be manufactured technically. Human utilization of soils thus must be aligned with the responsibilities of stewardship instead of consumerism. Agricultural practice and policies must follow the guiding principle: Feed soils, not crops. Soils are ecosystems which synthesise as well as decompose organic matter and make available inorganic matter for soil life, thus enabling growth and evolution of myriads of plants and soil organisms. Healthy soils produce healthy plants. Healthy soils need a balance between cultivation (withdrawal) and regeneration (restitution) of i.a. nutrients, trace minerals, and organic matter. All-season cultivation of diverse plants including trees is by evidence an appropriate practice. Build soil-addressing institutions for permanent dialog, deliberation, and participation between the wider public, science and politics. As we can learn from the interfaces between climate change science and politics, progress on the national level can be fostered by strong and credible international structures. The institutional fabric as to fertile soils is fragmented and rather weak. The Intergovernmental Technical Panel on Soils (ITPS) should be transformed into an Intergovernmental Panel on Living Soils (IPLS) with a mandate to report and assess regularly status and changes, to facilitate international and regional cooperation and especially impart successful practices to enhance fertile soils. As degradation and destruction of fertile soils increasingly become obvious as relevant driving elements of violent conflicts in many countries, cooperation and coordination between all parts of the UN system as well as between national governments is imperative. a comprehensive system of curricular modules in education, training, research and extension regarding the importance and enhancement of fertile soils. Equitable and just distribution of fertile soils in all countries is one of the most important conditions for success of NSPs. Outline and negotiation of NSPs should be organized by means of inclusion, openness and participation and related to national action and implementation plans for the Sustainable Development Goals (SDGs). End agricultural subsidies worldwide that are harmful for soils and the environment in general. Soils in most countries are damaged by use of mineral fertilizers and pesticides. Production and use of these chemicals only are competitive because of huge subsidies for fossil fuels. Science eventually must tackle the challenge of understanding the systemic complexities of living soils and soil improvement. Considerable, long-term oriented expansion of analytical and empirical knowledge on qualities and functionalities of fertile soils is needed. Soil science is a truly trans-disciplinary field of scientific endeavour which until today is neither institutional nor financial appropriately endowed. Especially international research networks with coordinated agendas should be promoted. But the quality of international research communities depends on accordingly building and maintaining national capacities. A crucial element of agenda setting and research design is the practice of participatory research.